Buddy was established in 2007 when Springloops, a well known subversion hosting platform for web developers, with deployment tools was bootstrapped. Bootstrapping it enabled the team gather experience, information and new technology trends that led to the invention of Buddy. The platform uses its peer-to-peer (p2p) network to moderate its DAO. List of peers by other nodes is gotten when a new peer(s) reports his/their address(es) to the organization (token holders) and the nodes can also report a broken or untruthful peer to Buddy. To monetize the industry of app development automation. Organizations find it hard to carry out development automations despite its potentials that is revolutionized. This is because, the application automation is problematic to adopt despite being a huge boon, the large amount of several tech, stacks and workflow imply the difficulty for a single party to make available, the seamless automation needed to cover all the popular programming languages, services and frameworks, including Block chain technology etc. To solve this, Buddy is uniquely positioned with a blistering product that solves the biklion-dollar markets’ and distinguished brands’ problems with success. The version of the platform that is self hosted will be used as the foundation for the decentralized application development automation partnerships with Google, Github, Microsoft, Amazon, Docker. There is also a problem of parallelism. Platforms seek to fasten times of delivery and eradicate unimportant queues at the same time. 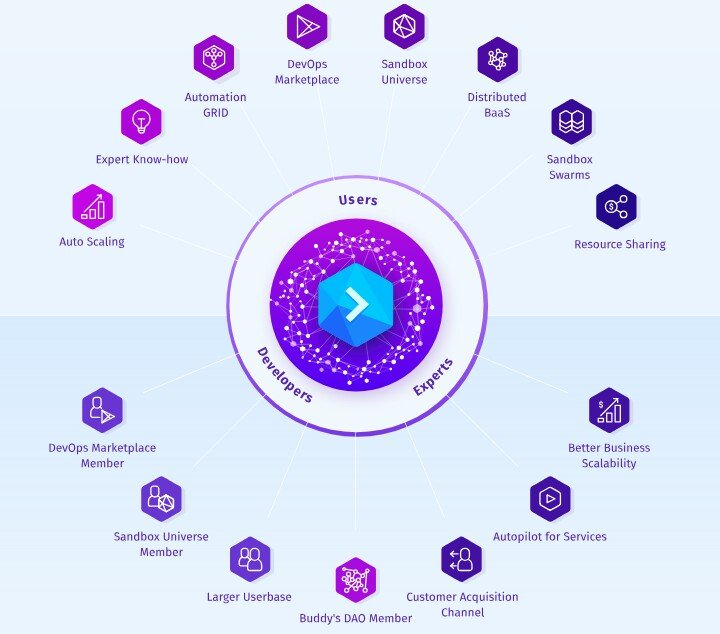 To solve this, Buddy uses 80 carefully designed actions of automation that aids users in the development and deployment of software by carefully placing the actions into pipelines to enable building, testing and deploying be a matter of few clicks. The platform is accessible to third party developers to deliver their actions within the ecosystem and still utilize them in their own development application pipelines. This is to extended accessibility of the platform. Third party developers can make profit on the platform by charging for the solutions they provide for the DevOps marketplace and can also publish plugins freely. Buddy will allow only qualitative submissions to protect authors from people who plagiarize by curating the marketplace. The token holders of the platform will enable the creation of the marketplace content. Developers will aid the advancement of the bloc chain technology to applaud innovations and support other talented developers. dAppOs in Buddy team is a well-cut foundation serving for smart contracts/dApp projects used during training in blockchain. It enables a much easier education of blockchain development since programmers would be focusing on realtime training instead of installing and configuring a lot of dependences and stacks in an attempt to prepare their environment. BUD is an ethereum based utility token. It enables an economy that is decentralized and community driven. In the developers, experts and users’ (both SMB and enterprise) goal to enable secured, quick and better quality applications, it unites them. BUD is also used to enhance a transparent and secured system for the participants (users), provide a powerful and trusted utility, develop incentives that are strong and economic, enhance the platform using effects of network ownership, and stand as a source to govern the affairs of the system. The organization (token holders) will enable the curation of DevOps marketplace, whitelist participating nodes in the shared automation GRID, certify apps on the DevOps marketplace that are third party, and eliminate bad/untruthful actors etc.